As it stands, the mushroom is a pretty multi-purpose organism: Aside from its ecological functions, it can be eaten as nourishment, brewed as tea, taken as a naturopathic remedy, and used in dyes. But a San Francisco start-up by the name of MycoWorks has even more plans for mushrooms, starting with a leather-like material made from the fungi. More specifically, MycoWorks’ key ingredient is mycelium, the microscopic, root-like threads of a mushroom that latch onto and colonize different substrates. As a natural fiber, mycelium is particularly attractive because it can be grown and manipulated into myriad textures and shapes, according to Phil Ross, the chief technical officer at MycoWorks. Ross had a self-described “very strange journey” to becoming the main innovator at the young company. An artist and cook, Ross began collecting mushrooms in the late 1980s for the various kitchens he worked in, and later became inspired by the books of mushroom expert Paul Stamets to set up his own lab and clean room to grow fungi. That’s when Ross began experimenting with mycelium. He found that, with enough prodding, he could coax it to grow into different formations, and that by adding organic chemicals at different stages of the growing process, he could change the look and feel of the resulting material. Working with mycelium is “like learning a cooking technique,” he says. As an art project, Ross constructed various architectural models of iconic metropolitan buildings out of mycelium. Companies that caught wind of his efforts then began approaching him, so Ross decided to start MycoWorks in 2013 with his friends Sophia Wang and Eddie Pavlu to contemplate mycelium’s possibilities. Their first major project was creating bricks of engineered “wood” made from mushrooms, but the team found the construction market hard to break into. After various apparel makers showed interest in their work, however, Ross’s team found a way to reformat their material into a sheet akin to leather. 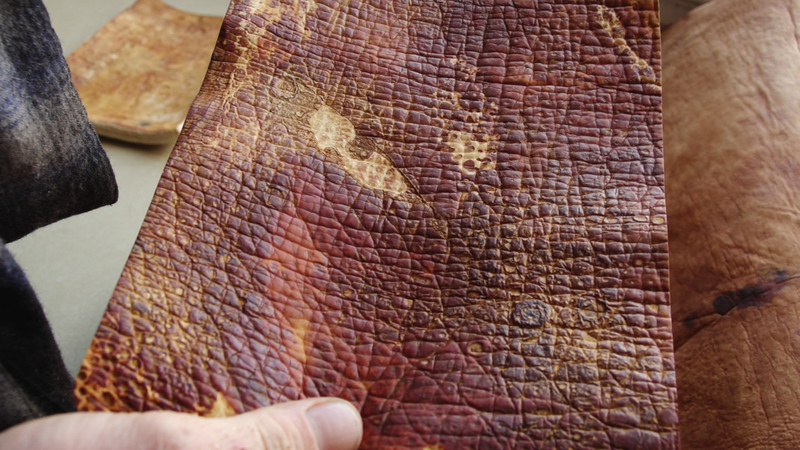 MycoWorks’ leather is made out of pure mycelium. The company primarily grows Ganoderma lucidum, also known as the reishi mushroom, a popular fungi in Asia that’s commonly used in natural remedies and teas. They chose this species “in part because it has this enormous written history around it—about its biosafeties [i.e., how it interacts with human skin], about its biochemistry, about its application for human consumption,” Ross says. “Because we are creating this brand new, novel type of material in the world, there’s a huge burden on MycoWorks as a company to prove the safety of this. So we’re going with what we know to be the safest and ubiquitously ingested fungus on the planet,” he says. Reishi mushrooms are also relatively easy to cultivate. In the wild, they primarily grow on dead or decaying wood, breaking down lignin to access nutrients in the cellulose, says John Taylor, a plant and microbial biology professor at the University of California, Berkeley. Those compounds are also easily accessible in biofuel waste and agricultural refuse such as sawdust, corncobs, and hemp hurd—all of which MycoWorks has used to produce its mushrooms. 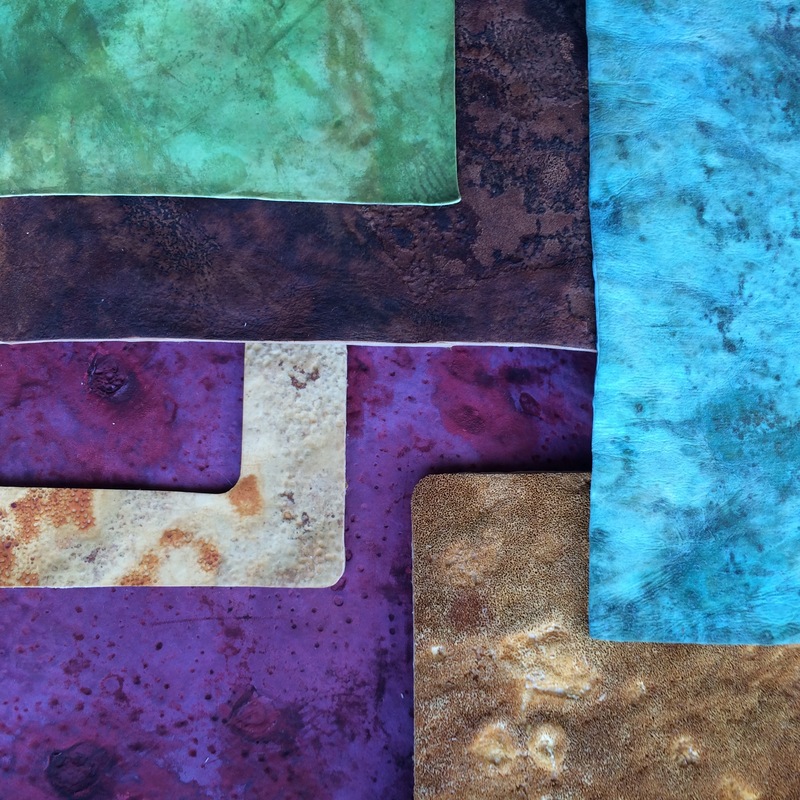 To transform the mycelium into MycoWorks’s leather-like material, Ross’s team uses a process they’ve refined over time, which they can tweak depending on a customer’s specifications. For instance, they might alter the nutrition of the mushroom at different phases of its life cycle. They can also adjust temperature, light, humidity, and gas levels in the mushroom’s environment, or apply essential oils or other organic methods to change how the tissue develops. There are still questions to answer. For one, MycoWorks is testing how long the material can last, and to that end, is researching preserving oils and other agents used in traditional leatherworking. Further, the company is continuing to experiment with how to scale up production. Ross says that right now, they can produce a slab of mycelium that’s 27 square feet—comparable to a full-size cowhide—in two weeks. They hope to get the process down to about a week, and eventually ramp up production so that they can efficiently produce millions of square feet each year, and maybe even build facilities in other U.S. cities. MycoWorks is already working with designers to shape the mycelium to suit their needs. Ross likes to say that his material is “programmable,” because it can be manipulated for myriad uses, including—but not limited to—apparel, accessories, furniture, and possibly even electronics. “Like any biological product, it could then be a substrate for other biology, for other life,” Taylor says. “So things could eat it. For example, other fungi might eat it.” (Ross says they treat the mushroom leather after the growing process to prevent this.) If anything, Taylor imagines a consumer might just have to take more attentive care of her fungal product than, say, her pleather ones. Some people respond almost primitively upon touching the material, Ross says. Learn about mushrooms, and trade your favorites with your friends!